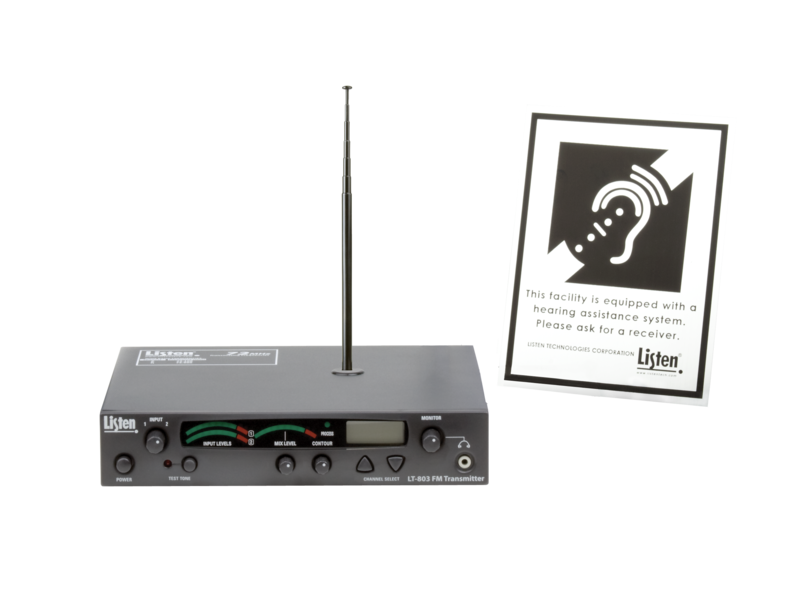 Economical 72MHz digital RF transmitter package including the LT-803 transmitter, antenna, and signage kit. The LT-803-072-P1 Stationary 3-Channel RF Transmitter Package 1 (72 MHz) shall include (1) LT-803-072 Stationary 3-Channel RF Transmitter (72 MHz), (1) LA-106 Telescoping Top Mounted Antenna (72 MHz), and (1) LA-304 Assistive Listening Notification Signage Kit. The stationary RF transmitter shall be capable of broadcasting on one of any three channels – A (72.100 MHz), E (72.900 MHz) or H (75.900 MHz). The transmitter shall have a SNR of 62 dB or greater. The output power shall be adjustable to quarter, half or full. Channel tuning shall be capable of being locked. The device shall have an audio frequency response of 50 Hz to 15k Hz, ‘± 3 dB at 72 MHz. It shall have two (2) mixing audio inputs. The device shall have the following audio controls: input level, mix level and an adjustable low pass filter (contour). The device shall have an audio processor that is capable of automatic gain control and limiting. The Listen LT-803-072-P1 is specified. 1. POWER BUTTON: Easy access from the front to turn unit On/Off. 2. INPUT 1 & 2 AND INPUT LEVEL INDICATORS: Adjust audio levels of Input 1 and 2. 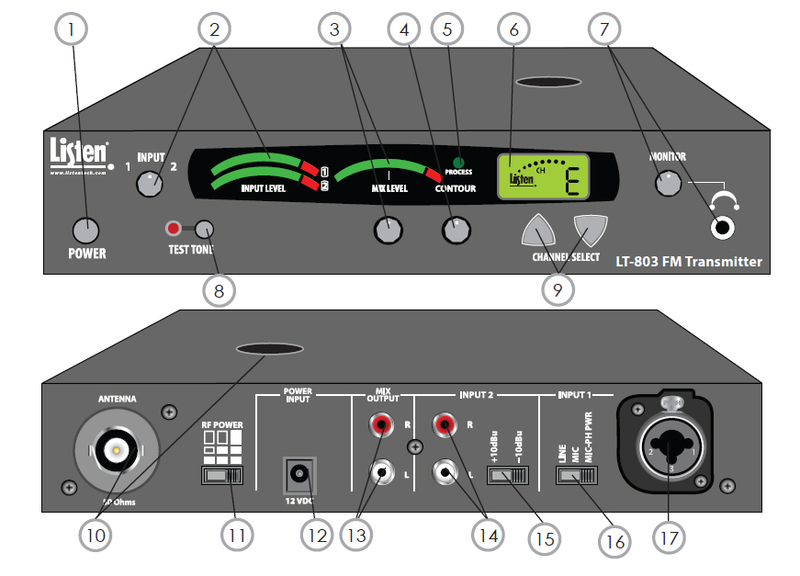 Dual VU meters shows audio Input 1 and 2 levels. 3. MIX LEVEL & MIX TRANSMIT LEVELS: Mix Level control sets level of mixed audio. VU meter shows the output level of mixed audio. 4. CONTOUR: Contour equalization Cuts/Boosts frequencies above 5 kHz. 5. PROCESS LED: Processing (automatic gain control and compression) can be turned on and off from the front panel. 6. LCD DISPLAY: Shows channel selected, channel lockout, and RF power. 7. MONITOR LEVEL: Earphone jack and volume control to check audio integrity of transmission source. 8. TEST TONE: The test tone level adds flexibility when setting up and testing system. 9. CHANNEL SELECT: UP/DOWN channel selection of 3 channels (A, E, H). 10. RF ANTENNA OUTPUTS: Top mount, rear mount, and remote antenna options. 11. RF POWER LEVEL: Multiple transmitter power settings (full, ½ and ¼) with indication on LCD display. 12. POWER INPUT: In-line power supply (included) attaches. 13. AUDIO OUTPUTS: Two (2) phono connectors for a mixed output of Inputs 1 and 2. 14. AUDIO INPUT 2: Two (2) unbalanced phono audio inputs. Select either +10 dBu or -10 dBu. 15. INPUT 2 LEVEL SWITCH: Set switch to match the level of Input 2 source. 16. INPUT 1 LEVEL SWITCH: Set switch for line or mic level. Phantom power available in Mic-PH power position. 17. AUDIO INPUT 1: Balanced XLR / ¼ inch audio input. Select either mic, line, or mic phantom power level for input. Electret (Condenser) microphones can be used with Input 1, mic, and phantom power. Q What is the range of the LT-803-072 transmitter? A Line of site up to 305 m (1,000 ft.) with remote antenna. Q Does the LT-803-072 include the rack mount? A No, but an LA-326 Universal Rack Mounting Kit is available for purchase. Antenna options for rack mounting also available. Q Is there a limit to the number of LT-803-072 transmitters I can use in one room? A Yes. The maximum is (3) three. Q Is the LT-803-072 compatible with Listen's other receivers (LR-300-072, LR-400-072, LR-500-072, LR-100-072, and LR-600-072)? A Yes. Remember, the LT-803-072 has only three (3) channels (A, E, H) therefore the receiver will need to be tuned to one of those channels. Also, the SQ (Super Quiet) function must be turned off on the receiver. Q Do I need a transmitter for each audio source? A Each audio source requires a transmitter. Q How many receivers can I have on a system? A As many as you want. The transmitter simply transmits a signal and you can have as many receivers pick that signal up as necessary. It's like a radio station transmitting and the receivers are the radios tuning into the "channel".